President Maithripala Sirisena yesterday dismissed Opposition claims that the country’s economy was in crisis, saying there was progress now following the stabilisation and revival measures put in place since the election of the coalition Government. “Anti-Government economists and analysts have been claiming the country is facing an economic crisis. My main message for people in the New Year (Sinhala-Tamil) is that we are not heading for an economic crisis. The economy is sound and getting stronger and progressive,” President Sirisena told newspaper editors and heads of media yesterday. He pointed to foreign reserves of over $ 5 billion, positive sentiments from the World Bank and the International Monetary Fund and growing exports with record prices achieved by tea, rubber and coconut as leading indicators. He said producers of these crops as well as rice were benefitting though he had some concern over the impact on consumers. Sirisena also highlighted a reduction in pharmaceutical and healthcare costs as unprecedented relief for the people. The successful completion of the revamp of the runway of the Bandaranaike International Airport as well as the conclusion of the open tender for the airport duty free operations with higher (40%) revenue to the Government as opposed to 24% previously were also cited as progressive measures. “When we took office, the CTB had EPF, ETF arrears of Rs. 12 billion. We have managed to reduce it to Rs. 6 billion. We have also resolved longstanding issues concerning CTB and Railway land,” the President added. “Let me emphasise that the biggest betrayal (by President Rajapaksa) was allowing the development of the Port City on a freehold basis. After we came to office, we negotiated with China and made it leasehold,” Sirisena reiterated. He also said that the Government was successful in winning the confidence of the international community and its support. The most recent case in point was the UNHRC giving Sri Lanka two more years to make rapid progress towards reconciliation. The President revealed that over 60% of the resettlement of IDPs in the north and east has been completed and the balance will be done soon. The issue of missing persons is also being addressed. State heads to roll soon, Ministers too? 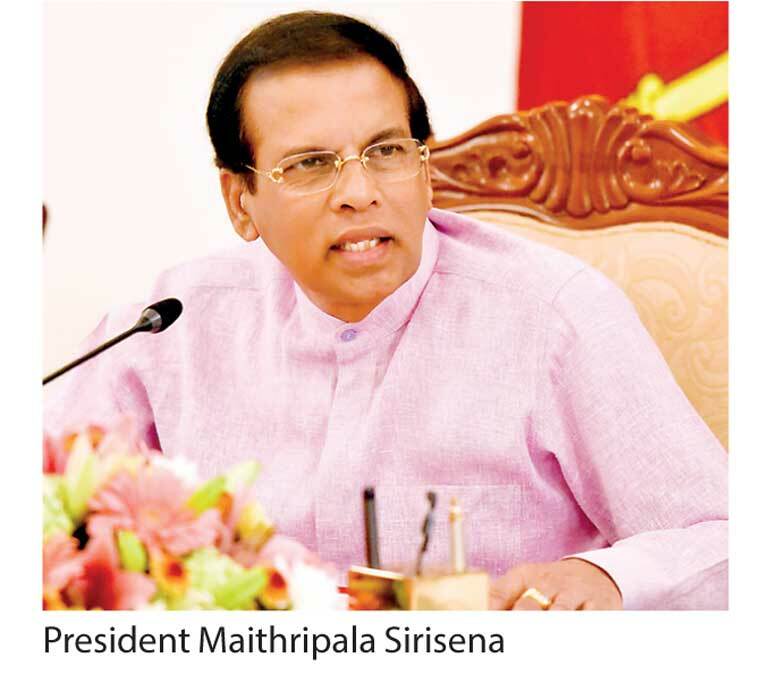 President Maithripala Sirisena yesterday said the public sector would be revamped soon with a change of the heads of state institutions and hinted that there could be revisions in the Cabinet as well. “There have been complaints of inefficiency and indecision in the State sector. Within the next two weeks there will be a fresh thrust in the public sector with changes in positions and procedures,” the President told newspaper editors and media heads yesterday. Asked if there will be a Cabinet reshuffle, which has been speculated for many months, the President replied that everybody would be able to see the changes before Vesak. Earlier on the President said that provincial meetings should be held monthly to review the progress of development projects. However, such meetings have not been held during the whole year due to the inability of ministers and district officials to meet. Therefore, the President suggested that the relevant officials prepare a timetable for the whole year, scheduling the meetings in advance and sending the schedule by mail to all the relevant heads of Government institutions and officials to ensure their attendance at the meetings. Earlier in the week Sirisena urged district officials to complete development projects in their district on time and vest them with the people. The President made this observation on Tuesday when he presided over the Polonnaruwa District Special Coordinating Committee meeting at the Pulathisipura National Education Academy Auditorium. President Sirisena held a lengthy discussion reviewing the progress of the district development projects and the future actions of the projects currently being implemented.